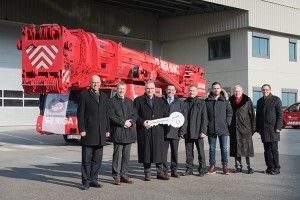 The two Managing Directors of Riga Mainz GmbH & Co. KG, Uwe Langer and Karl Reitz, as well as senior manager Friedel Langer and son Tim Langer visited the Liebherr plant in Ehingen to take delivery of their brand new LTM 1500-8.1. The new crane will replace a 14-year-old model of the LTM 1500-8.1 at Riga, which has done sterling work at the company. “It’s the best crane in the world” is how Uwe Langer describes the Liebherr 500-tonne machine, backing up his statement with a few facts: “The LTM 1500-8.1 delivers high load capacities over the entire working range and it is very versatile in use. Its overall handling, function and control system are superb.” One of the reasons behind the success of the LTM 1500-8.1 is the variability of its telescopic boom. The crane can be operated with a 50-metre or 84-metre telescopic boom. Crane contractors also appreciate its ease-of-use and the simple, fast erection processes, for example the installation of the ballast, the Y guying and the lattice jibs.